I was born in the small town of Goettingen in the middle of Germany. I’ve always enjoyed movement and music but when I had to make a choice between intensifying my training in rhythmic gymnastics or my piano lessons I decided to opt for the former. I thought this was the best way to combine my two passions. Soon, I made it into Germany’s National Team and was awarded National Champion six times. I competed in a generation when elegance and long lines where especially demanded, which was a good fit for me. Already at a young age I was known for aiming for technical precision and for taking high risks. And yes, my favorite apparatus was the hoop. 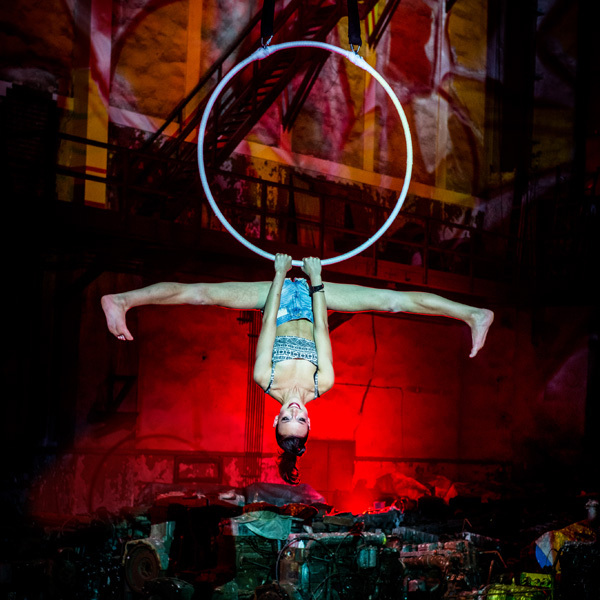 It was in 2006, while finishing my career as a competitive gymnast, when I first joined Feuerwerk der Turnkunst, Europe’s biggest touring show under the direction of Heidi Aguilar. The feeling of performing for a grateful audience left me amazed. I fell deeply in love with presenting my skills on stage but I didn’t think it would ever become my profession. I had always planned on becoming a doctor like my parents because the combination of humanism and science excited me. When I was looking for an apartment in Berlin in order to start studying there I got an offer from GOP, a known German cabaret chain with several theaters all over the country and decided to accept it. I postponed my studies and built my first acts based on my skills from rhythmic gymnastics. I did contortion, danced on points and juggled props over people’s heads. The circus arts and acrobatics surrounding me made me wish to try out something new though. I wanted to work in the air. I was especially tempted to explore movements on an aerial hoop so I decided to have one made in the dimensions I wanted and started training. In order to broaden my horizons I flew to Montreal where I created my first aerial act called "Bloodstream". I kept developing this act and acquiring new skills while touring the cabarets in Germany over the next years. In 2012 I was honored to present "Bloodstream" in my first big production Urbanatix under the direction of Christian Eggert which was a great motivation to keep evolving. In 2013 I was fortunate enough to join the famous French-Canadian company Les 7 Doigts de la Main. The creation of the show Amuse in Canada and its presentation in Mexico were my first job outside of Germany. 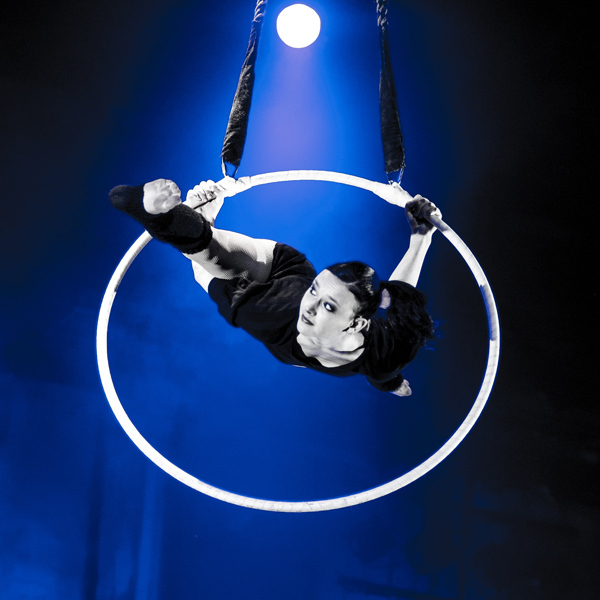 It encouraged me to train further in circus disciplines and to get more into play and character work – and from this point on I knew I wanted to keep performing. I developed my well recognized act called "Girl in Jeans" which portrays female independance, freedom and strength. It led me to performing a season with La Soirée in New York City and afterwards to a run of almost two years with Absinthe in Las Vegas where it was performed more than 1500 times. Feeling in need of change during this long contract I reinvented my stage personality and created the act "Mirror", painting the image of dreamlike elegance and fragility, which I first presented at Feuerwerk der Turnkunst. It was pure joy to return to this show I had joined as a teenager and an honor to accept the offer of the company to keep working with them as a choreographer and director in the future. In 2016 I joined Teatro ZinZanni where I learned to love the world of dinnershows. I presented several acts and got to explore audience animation and character play during our three-hour-long show. It was in 2017 when the street arts show Urbanatix called me back and asked me to perform in an act with powermover PetAir. We decided to pursue this idea and to explore the combination of breakdance and aerial acrobatics. Together with b-boy Lil’Amok we founded our project "ArtCore" and got chosen to present our act at the world renowned circus festival Cirque de Demain in Paris 2018. In summer 2018 I moved back to Las Vegas where I’m currently performing Wednesday through Sunday in Absinthe, showtimes are 8pm and 10pm. Aside from performing in shows and events of all kinds I enjoy modeling and taking part in music videos – two activities I’ve carried on with during the past years. I also give private lessons or workshops upon request.